In the second half of last year, phone maker Vernee launched its bargain-priced Mars — a thin, stylish, and powerful handset that didn't require one to break the bank to get. Now, the company is going full steam ahead and releasing the reiteration of the Mars, called the Mars Pro. The new phone shares a lot with its older sibling — it has slim, 1 mm side bezels around the screen, ensuring that the 5.5-inch display doesn't translate into a hard-to-handle handset. The metallic body is overall quite slim as well, measuring at 0.3 in (7.6 mm) despite the fact that it houses a rather generous 3,500 mAh battery. The Mars Pro turns the dial up when it comes to hardware. An octa-core MediaTek Helio P25 SoC is its beating heart, assisted by 6 GB of RAM — a fair amount by all accounts. The onboard storage is locked at 64 GB, which is still quite good. The display panel is built by JDI and provides a 178-degree viewing angle and a 95% coverage of the NTSC gamut as per official claims. As can be expected, the phone ships with Android 7 Nougat pre-installed and it's in a pretty close-to-vanilla condition. 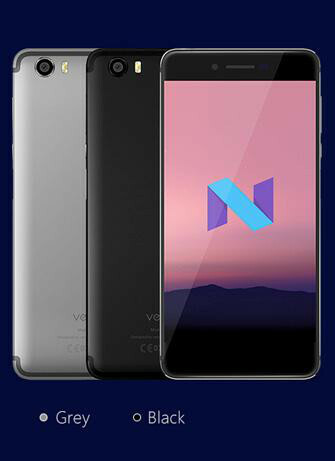 Future updates are not out of the picture, too, considering that the Vernee Mars, which shipped with Android 6 Marshmallow, was updated to Nougat not long after Google's latest OS became official. The back snapper has a Sony-made IMG258 13 MP sensor and a lens with a fairly wide aperture – F2.0. The camera is quick to focus thanks to phase detection autofocus tech and it's assisted by a dual-tone LED flash for natural colors in the darkest of moments. The selfie cam is a more modest 5 MP one. Now for the price: the Mars Pro is currently in a pre-sale stage and can be ordered for $179.99. Come July the 4th, that promo price will rise up to $199.99, which is still a bargain price point for what we get. If you follow the link below, you can also take part in a giveaway — if you happen to have a social following, which you can review the phone for — or a $40 coupon raffle — if you don't. Or you can go ahead and pre-order it outright. Oh good, another ad. These need more visible notifications. I'll make sure to avoid Vernee stuff in the future. Btw, whats up with all these sponsored stories. And $179.99 is how much the 3D printed dummy of the iPhone8 is selling for. Yeah, house in a Mediatek Helio P25 and call it a flagship, yay! Flagship is related to each brand separately. Flagship means the highest-end smartphone designed by a brand. The Pro is just that. Therefore it's a flagship. But It's not Vernee's flagship.. is it? Apollo has a Helio x25 and 2k screen. It only lacks RAM (4GB) compared to the Mars Pro. If Vernee marks is as their flagship, then we cannot argue since the status is given by the brand. However, it's possible Vernee could give more than 1 device a flagship status, which seems insensible to me. actually it's not too bad. Somewhat comparable to SD820 in my OP3. but for half the price. so it is possible to get something good for low price. D Brand-sponsored phones in youtube, product-sponsored articles in phonearena. There's no escape anymore. You seem to watch Linus too much. Confirm it. I think MediaTek Helio P25 are a decent processor. Vernee run basicly stock android to. Yes it may not be a spec monster like OnePlus 5, but for this price Mars Pro seems like a good buy.